On Friday the science and geography department welcomed Dr Hazel Beaumont to lead sessions for A level geology and geography students. Dr Beaumont is a lecturer at the University of West of England, Bristol, specialising in sedimentary geology. The geology session focussed on sedimentary geology particularly on fluvial, desert and marine environments. 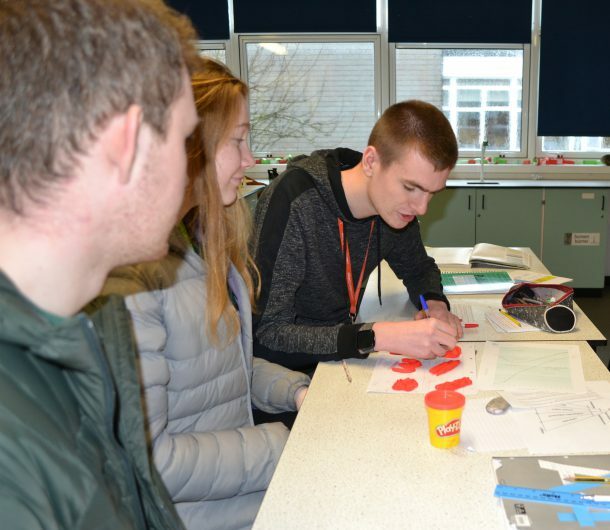 Students had the opportunity to analyse a range of rock samples and using their understanding of mineralogy and lithification to interpret past environments. They also used Play-Doh to model the different desert dune types. All excellent revision for the summer exams. Dr Beaumont also explained the different options when studying geography or geology at university, She highlighted that geographers remain among the most employable university graduates as employers continue to value geographical skills and insights in the workplace. Later in the day Dr Beaumont also led a session for Year 12 geographers on coastal management. The geography session consisted of an evaluation of the varying traditional and contemporary coastal management strategies used around the UK. Dr Beaumont shared and analysed findings from research compiled by her colleagues in coastal management at University of West of England. In light of the mounting pressure which the world will have to face due to rising sea levels, students considered the argument for a more sustainable approach to coastal management. The Year 13 geographers look forward to working alongside Dr Beaumont as part of the extended investigations they will be commencing later in the year.